CHRISTMAS VACATION MOOSE MUGS from CanadianMoose.com: Authentic. Handmade in the USA. FREE Shipping, in the USA (lower 48), for our Moose Mugs! Authentic Christmas Vacation MOOSE MUGS! "Can I refill your eggnog for you? Get you something to eat? Drive you out to the middle of nowhere and leave you for dead?" "Naw, I'm doing just fine." Welcome to CanadianMoose.com! As of 2018, we are 20 years young (and still going strong)! We have the AUTHENTIC CHRISTMAS VACATION MOOSE MUGS, hand-made, one at a time, with NO machine molds and with NO 'glued on' antlers (no 'Factory Direct' here). Made by the original artist, who made the Moose Mugs seen in the Warner Bros. Studios "National Lampoon's CHRISTMAS VACATION" movie, in 1989, these are the ONLY Moose Mugs made in the USA. CanadianMoose.com is the exclusive world-wide distributor of these beautiful hand-made glass Moose Mugs. The original Moose Mug, since 1989. Accept no imitations! Confused with all the cheap copies / replicas / imitations out there? WHY buy imitations when you CAN own the real thing? Clark W. Griswold, Jr. would be proud. FREE Shipping, in the USA (lower 48) and to Canada, for our Moose Mugs! FACEBOOK "WIN FREE MOOSE MUGS" CONTEST!!! 'Like Us' on Facebook (and get your friends to 'Like Us' on Facebook) for a chance at 2 of our authentic CanadianMoose.com Christmas Vacation Moose Mugs. Good luck! See our 'WIN FREE MOOSE MUGS ON FACEBOOK!' page for more information. 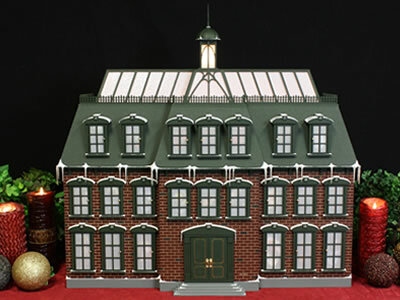 Want to see the Advent house/calendar that is opened in each scene/day in the Christmas Vacation movie? These houses really exist and they are incredible (and are hand-made in the USA)!! Just visit www.ChristmasAdventHouse.com and let them know CanadianMoose.com sent you!